Landscape stability is one of the most important parameters determining the state of the environment and changes occurring in it under the influence of natural and anthropogenic factors. The nature of landscape changes depends on the location in the geographical environment, their properties, and type and extent of the anthropogenic impact. Of particular importance is the estimation of landscapes stability of the Baikal basin, which is an environmentally critical area. Landscape stability is a property of a geosystem to maintain its structure and the mode of functioning under changing conditions of its environment [Protection of landscapes..., 1982]. An assessment and mapping of landscapes stability are made according to the complex of natural and anthropogenic factors of influence. The natural factor is mainly determined by the influence of climate (indicators of heat-moisture supply) and the properties of lithological-and-geomorphological basis. The anthropogenic influencing factor is associated with the background nature management, which is based on spatially extensive use of natural resources, and lands, closely related to the zonal-belt features of natural landscapes. The background types of nature management in the study area include agriculture, mainly in steppe landscapes, forestry in taiga landscapes, as well as recreation. Stability is considered in relation to landscapes of two levels: regional (geoms) and topological (groups of facies). A landscape map, compiled by the authors on the basis of landscape maps of the territory under consideration [Landscapes..., 1977; Landscapes..., 1990], was used for its mapping. Stability of landscapes of the regional level – geoms – is determined based on the level of natural ecological potential of a landscape (EPL), the main indicator of which is the index of biological effectiveness of climate (TK) according to N.N. Ivanov [Ecological..., 2007, Ecological..., 2007]. Characterization and comparative assessment of this indicator is based on the ratio of heat and moisture, on which the biological productivity of a landscape and ecological capacity primarily depend. At the same time, the influence of latitudinal and altitudinal zonality on their distribution is traced. A single and continuous process of moisture and heat exchange not only forms the spatial differentiation and a type of a landscape, but also determines its stability. Landscapes with high values of TK and EPL are the most stable, while low values ​​of these parameters characterize unstable landscapes. Twenty-two geoms are represented in the landscape structure of the territory under consideration. Mountain terrain predominates in the catchment area of ​​Lake Baikal. Therefore, this territory is characterized by the altitudinal belt differentiation of landscapes, which determines the degree of their stability. At the regional level, according to the values ​​of these indicators, landscapes are subdivided into five ecological groups of geoms, to which the corresponding values ​​of stability, ranged on a five-point scale, are assigned. These values ​​are considered as the starting point, or background stability. A geom unites groups of facies similar in structural-dynamic characteristics [Sochava, 1978]. This taxonomic unit is important in generalization of geotopological works. Inside a geom, stability was readjusted in respect of groups of facies with different dynamic categories. A set of variable states of these categories includes indigenous, pseudo-indigenous, serial and derivative geosystems under one epifacie. The highest natural and anthropogenic stability characterizes indigenous landscapes with well-established intrasystemic and external relations; many of them are notable for durability. Pseudo-indigenous landscapes, unlike indigenous ones, are modified as a result of hypertrophy of one of the components of the system. Serial facies in most cases are nondurable, quickly alternating with each other spontaneous geosystems, formed under the significant hypertrophy influence of various natural factors. In a range of transformation of geosystems they are characterized by the greatest variability and are prone to damage, and therefore they are classified as landscapes unstable to anthropogenic impacts. Derivative landscapes are variable states of geosystems caused by human influence. They are characterized by different degrees of stability. The highest values ​​of stability, considered as the initial point corresponding to the background rate of stability of a geom, are set for indigenous facies. Further on, the initial point is reduced to three gradations, namely, for pseudo-indigenous, serial and derivative facies. For pseudo-indigenous facies a decrease in the stability by 1 point in relation to the initial point is possible; for serial facies it can amount to 1-2 points. For derivative facies deviations from the norm can reach 1-2 points towards an increase or decrease in the stability depending on the type of succession, namely, progressive stabilizing or digressive destabilizing. To assess the anthropogenic stability of landscapes an analysis was made of disturbances of natural environment, arising under the influence of various types of human activities related to the background land use. According to the predominant nature of the background land use, the following types of functional load on the environment were distinguished: agricultural arable and grazing (mainly for steppe and forest-steppe landscapes), and forestry (for taiga landscapes) and recreation. Stability of arable lands was largely determined by the intensity of erosion loss, soil deflation and pesticide pollution, and natural self-purification potential of soils. Stability of natural-forage lands was determined in respect of plant communities to grazing and haymaking and was assessed according to the degree of degradation of hayfields and pastures, susceptibility to erosion and deflation, and recoverability of vegetation and soils. The most significant impact on the state of forests is made by commercial logging using the clear felling approach. Stability of forest landscapes was determined according to the degree of disturbance of forests by felling and fires, recreation, and agricultural use. Reforestation is influenced by changing temperature conditions, hydrophysical properties of soils, evolving erosion and cryogenic processes, deflation and waterlogging in felled and burnt areas. An important criterion for stability, i.e. forest bonitet, is an indicator of productivity and environmental growth conditions, evaluated by richness (trophicity) and moisture content of soil. Environmental factors, spontaneous and associated with the human activity, prevent natural reforestation; their progressive successions do not reach the original state. Such landscapes fall in the category of the most unstable. Recreational stability is assessed referring to the mass recreation and tourist-excursion activities. Indicators of the degree of recreational digression of landscapes, depending on the type and intensity of recreational influence, sensitivity and recoverability of landscapes, which together define their recreational potential, served as stability criteria. Stability of landscapes is a key indicator, based on which the regulation of recreational loads is made. The compiled map reflects the territorial diversity of landscape stability, characteristics of which is presented in the table. The lowest and low (I-II points) stability characterize goletz and sub-goletz landscapes presented in major mountain ranges in the north-eastern and south-western parts of the territory. In the north-east, they are goletz and sub-goletz landscapes of the Baikalsky, Verkhne-Angarsky, Barguzinsky, and Ikatsky ridges in the framing of the Severo-Baikalskaya, Verkhne-Angarskaya and Barguzinskaya depressions. In the Khovsgol region and in Southern Cisbaikalia they include the Eastern Sayan mountain structures. In the south-west, alpine meadows, and subalpinotype and subgoletz landscapes of the Khangai and Khentei uplands are characterized by low stability. Ecological potential of these landscapes is very low; TK is less than 8. The structure of geoms is dominated by serial groups of facies. They are characterized by severe climatic conditions and dissected mountainous terrain, active development of exogenous geological processes, and lack of heat and excess of moisture. The same values ​​of stability are assigned to steppe landscapes of depressions and valley bottoms, characterized by the excess of heat together with the lack of moisture, with manifestations of cryomorphism, waterlogging, water erosion and deflation, and soil salinization. 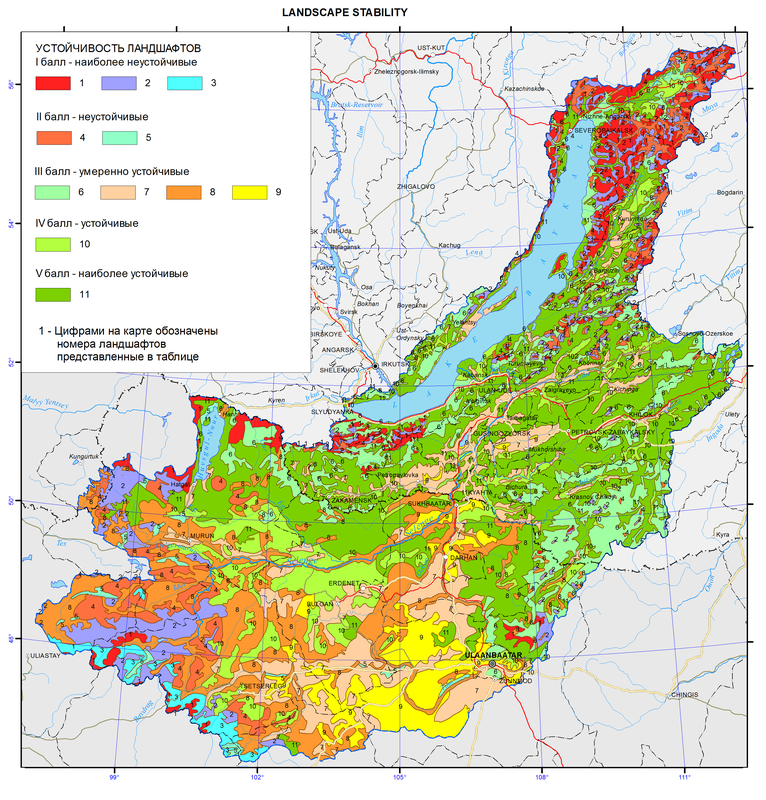 In general, the Baikal basin is dominated by moderately stable and stable landscapes (III-IV points), distributed mainly in the central part of the territory. They are characterized by medium and relatively high ecological potential; the index of biological effectiveness of climate amounts to 8-16. Pseudo-indigenous geosystems with a relatively stable landscape structure predominate. Landscapes of reduced development of mountain-taiga and taiga intermountain depressions and valleys, having dispersed distributional pattern and occurring in the Selenga-Vitim interfluve and to the north of the Khangai upland, are referred to the stability of III points. The stability of III points also characterizes piedmont and plain relatively dry and arid steppes. They are located in the Barguzinskaya depression, in hollows of the Trans-Baikal type, to the north of the Khangai upland, and in the surroundings of the Khentei upland. The group of geoms with the stability of IV points includes mountain-taiga landscapes of restrictive and optimal development, taiga piedmont landscapes of intermontane depressions and valleys of restrictive development, mountain low-bunchgrass and forbs-bunchgrass, and mountain dry steppes. The main areas of development of taiga landscapes of this stability group are low- and middle mountains to the south of the Eastern Sayan, the Primorsky ridge, Selenginskoe middle mountains, Vitimskoe plateau, Olekminsky Stanovik, Khentei-Chikoy upland, and others. Mountain steppes with IV points of stability are most commonly found in the Selenge-Orkhon interfluve. Landscapes with the highest ecological potential for the region, and TK amounting to 16-20, are classified as the most stable (V points). In the Russian part of the territory, they are landscapes of piedmont and intermountain depressions of optimal development, as well as piedmont subtaiga landscapes. They are found in the Verkhne-Angarskaya and Barguzinskaya depressions, in the Selenga river delta, and in depressions of the Trans-Baikal type. In Mongolia they are represented by mountain subtaiga landscapes, the large area of which is middle and low mountains lying to the north of the Khangai upland in the central part of the basin of the Selenge and Orkhon rivers. The structure of geoms is dominated by pseudo-indigenous and indigenous geosystems. They are the nuclei of the ecological stability and reproduction of the environment [Mikheev, 2001]. In the landscape structure of the region their distribution area is in the transition zone between taiga and steppe landscapes with low background stability. The conducted mapping of landscape stability is the basis for the assessment of the anthropogenic impact on the environment, and for substantiation of environmentally acceptable nature management in the Baikal basin. Landscapes of the south of Eastern Siberia (map, scale 1:1500000). (1977). V.S. Mikheev and V.A. Ryashin. Moscow: GUGK, , 4 sheets. Landscapes (map, scale 1:3000000) (1990). in National Atlas. Mongolian People's Republic. Ulaanbaatar–Moscow, pp. 83-85. Mikheev, V.S. (2001). Landscape synthesis of geographic knowledge. Novosibirsk: Nauka, 216 p.
Protection of Landscapes. Explanatory Dictionary. (1982). Moscow: Progress, 272 p.
Sochava, V.B. (1978). Introduction to the Theory of Geosystems. Novosibirsk: Nauka, 320 p.
Ecological potential of landscapes (map, scale 1:15000000). (2007). In National Atlas of Russia. Vol 2: Nature and Ecology. Moscow: PKO “Kartografiya”, p. 417. Ecologo-geographical map (scale 1:15000000). (2007). In National Atlas of Russia. Vol. 2: Nature and Ecology. Moscow: PKO “Kartografiya”, pp. 454-456.